With a wicked winter blast that dumped as much as 50 centimetres of snow on parts of the Lower Mainland finally over, the concern is now turning to ice. Over the next week, daytime temperatures above the 0 C mark are expected to start melting the accumulated snow, while below-freezing temperatures threaten to turn that melt into ice overnight. "We've got to keep that in mind and expect to be as busy as we have been for the next little while," said Assistant Chief Jeff Snider of the Abbotsford Fire Department. The cycles of melting and freezing also threatens to make driving conditions treacherous over the coming days. "When there is ice, again, the same tips for driving: leave lots of room and slow down," said Abbotsford Police Sgt. Judy Bird. Environment Canada lifted its snowfall warning for Metro Vancouver and the Fraser Valley, but the storm packed one final punch along parts of Highway 1 Wednesday morning. Later in the day, the agency issued a special weather statement for Metro Vancouver warning of a "wintry mix" with a storm forecast for Thursday night and Friday. Freezing rain may also occur over parts of Metro Vancouver, the Fraser Valley and Howe Sound during the transition from snow to rain. Several centimetres of snow fell in Abbotsford overnight, causing major issues on the highway for commuters Wednesday morning with the highway covered in compact snow. There were slowdowns for hours. High winds created snow drifts and blinded drivers. And with plows unable to keep up with all the snow that had fallen overnight, the accidents kept climbing. Abbotsford police urged drivers to be careful. Around 6 a.m. along some stretches of Highway 1, police say their officers were only able to travel about 40 km/h. Video posted to Twitter by Abbotsford Police Const. Mike Willford also showed treacherous conditions on a plowed route near South Fraser Way near Clearbrook Road. Abbotsford police are once again urging drivers to properly clear snow from their cars. BC Transit has cancelled bus service in several areas of the Valley due to weather, including in Abbotsford, Chilliwack, Hope, Agassiz and Harrison. 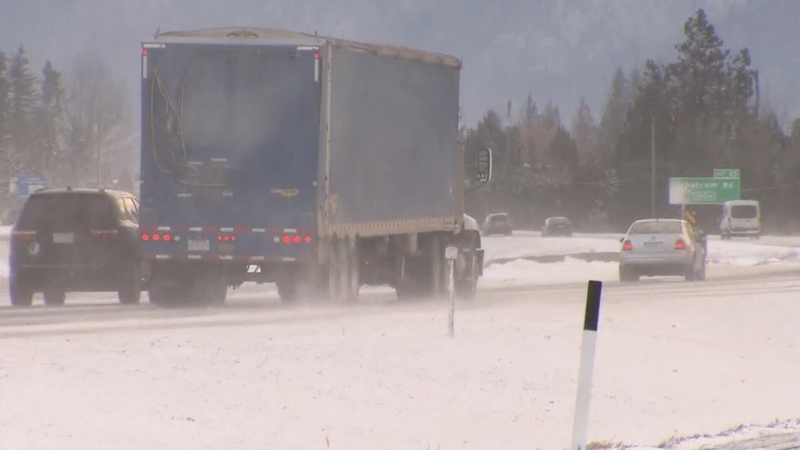 Closer to Vancouver, road conditions are much better after plows and salting trucks spent the overnight hours cleaning up the fresh snow that fell. Main roads in most areas of Vancouver are slushy, while side streets remain challenging, many side roads are still covered in a thick layer of compact snow. TransLink was reporting no major issues Wednesday morning, although SkyTrain service on the Expo and Millenium Line has been reduced due to snow and ice. SkyTrain attendants are once again aboard all trains. People who travel by bus may also see additional crowding Wednesday. On some routes 60-foot articulated buses have been replaced with 40-foot buses as TransLink says they have better traction in the snow. Some relief may be coming later Wednesday, with a high of 2 degrees in the forecast in Vancouver. There is a mix of rain and flurries in the forecast for Thursday. Vehicles are seen driving on an icy Highway 1 in this image from Feb. 13, 2019. 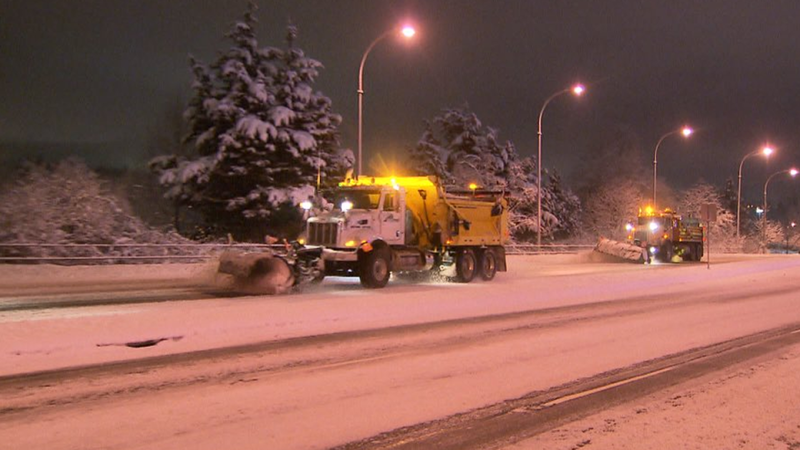 There was another busy night for salting and plowing crews in the Lower Mainland, but Environment Canada has now ended its snowfall warnings.